They have scrubbed up beautifully. Just right for some nice summer cocktails served up in those jugs, or Pimms maybe. I can see a lovely trifle or tiramisu in that pink bowl. Just right for your shop opening party! You were lucky there all we found was rubbish. 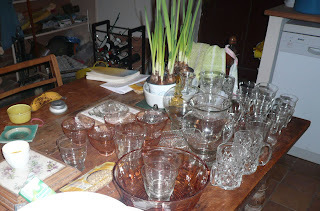 the glasses are lovely i just love to see glassware shining.